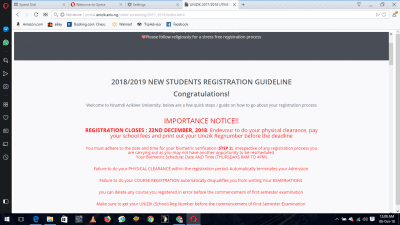 UNIZIK Admission List for the 2018/2019 academic session has been made available on JAMB’s Website. Candidates can check their admission status on JAMB CAPS. This is to inform all candidates who applied for admission in Nnamdi zikiwe University, Awja (UNIZIK) and participated in the Post-UTME Screening that the UNIZIK Admission List has been made avilable on JAMB CAPS.